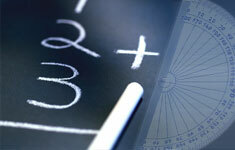 Linear equations are those equations that describe a straight line. That is, one amount is directly proportional to another, plus a constant. Note: x and y are variables while b and m are constants. The constants are placeholders until you can fill in the value from an actual problem. They are not variables, and once youâ€™re given a value they cannot change. We call m the slope, because it tells you how much y increases for each change in x. It is equal to the â€œrise divided by the runâ€ on its graph. We call b the y- intercept, because it tells you the value of y when x = 0.